Since I am cleaning house and grading papers, I will make this short. 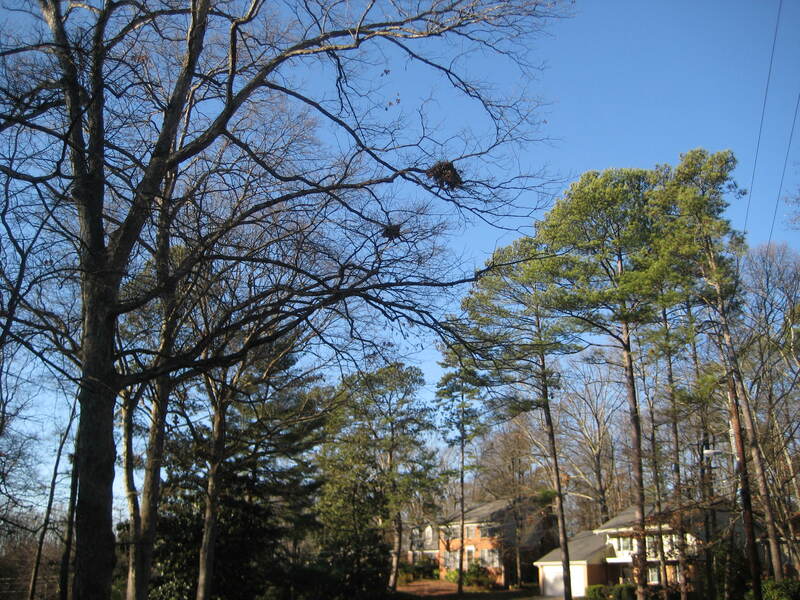 This morning, while walking our dog–incidentally, I recommend walking with or without a four-legged friend–I saw several squirrel nests high up in the bare winter trees. The squirrels wedge sticks and leaves into the junction of multiple branches. Usually they need just three to start. This idea of building on a foundation of three reminded me of an earlier post about constellations. I proposed that teachers talk with each other about the three guiding stars of their work. Then–meaning this morning– my balloon of a mind drifted to a memory of a bird’s nest I saw while visiting family in North Carolina last month. In an eight-foot dogwood, a bird had added a small twig to form a triangle. Part way out on one of the young tree’s branches, a “Y” had formed. This bird, knowing the strength of triangles, lay his twig across to form an equilateral. On that foundation, he placed the pine needles, oak leaves and plastic bits of his nest. I suppose it’s just simply fun sometimes to notice such connections. In addition, frameworks–conceptual, celestial or domestic–help us two-leggeds and four-leggeds to build things. As a father of triplets…I am in accord with the three’s of your nicely done view here….The solid foundation in nature and in manmade things of three’s ensures endurance, predictability, and even comfort….Just ask any traditional farmer at the milkish end of any worthwhile cow. Nice. “Milkish end” is nice. 2. What should we read? 3. How should I read? Seeking answers to those will always take you on a journey worth traveling.